Nearly two dozen individuals had some sort of sensory encounter with the golden plates that Joseph Smith discovered on a hill near his farm.1 The full weight of these combined reports is certainly impressive. Yet, some may wonder what other kinds of evidence, aside from these witnesses, can help verify the reality and authenticity of the ancient artifact in the prophet’s possession. Finally, several witnesses remarked upon the beauty and seeming antiquity of the engravings on the plates, which the Book of Mormon calls “reformed Egyptian” (Mormon 9:32).18 It is now known that before and during Lehi’s day, ancient Israelites implemented Egyptian characters in their scribal tradition.19 There is also emerging linguistic evidence which suggests that Uto-Aztecan, an ancient American language family, may have been influenced by Egyptian.20 Thus, from both the Old and New Worlds, there are good reasons to accept the use and adaptation of Egyptian characters, as described in the Book of Mormon. 1. These witnesses include Joseph Smith, Jr., the Three and Eight Witnesses, and a number of informal witnesses, including Emma Smith, Lucy Mack Smith, William Smith, Katherine Smith, Mary Whitmer, Josiah Stowell, Joseph Knight, Sr., Alva Beaman, and Martin Harris’s wife and daughter. For the strength of these combined witnesses, see Neal Rappleye, “‘Idle and Slothful Strange Stories’: Book of Mormon Origins and the Historical Record,” Interpreter: A Journal of Mormon Scripture 20 (2016): 21–37; Daniel C. Peterson, “Tangible Restoration: The Witnesses and What They Experienced,” FairMormon presentation, 2006, online at fairmormon.org. See also, Book of Mormon Central, “Evidences of the Book of Mormon: Plates,” online at bookofmormoncentral.org. 2. Several individuals claimed to have seen the stone box where the plates were buried. See Michael Hubbard MacKay and Gerrit J. Dirkmaat, From Darkness unto Light: Joseph Smith’s Translation and Publication of the Book of Mormon (Salt Lake City and Provo, UT: Deseret Book and Religious Studies Center, Brigham Young University, 2015), 9–10. 3. Although we don’t know how many of the sacred Nephite relics were stored in this stone box, we know for certain that it at least held the breastplate and the Nephite interpreters. For a discussion of these artifacts, see Don Bradley, “Piercing the Veil: Temple Worship in the Lost 116 Pages,” FairMormon presentation, 2012, online at fairmormon.org. 4. See John A. Tvedtnes, The Book of Mormon and Other Hidden Books: “Out of Darkness Unto Light” (Provo, UT: FARMS, 2000). 5. See Exodus 25:19–20; cf. Genesis 3:24; Moses 4:31; Alma 42:2. 6. See Tvedtnes, The Book of Mormon and Other Hidden Books, 33–35, 119–121, 161; Bradley, “Piercing the Veil,” online at fairmormon.org. 7. See Tvedtnes, The Book of Mormon and Other Hidden Books; William J. Hamblin, “Metal Plates and the Book of Mormon,” in Pressing Forward with the Book of Mormon: The FARMS Updates of the 1990s, ed. John W. Welch and Melvin J. Thorne (Provo, UT: FARMS, 1999), 20–22; William J. Adams, Jr., “Notes and Communications: Lehi's Jerusalem and Writing on Metal Plates,” Journal of Book of Mormon Studies 3, no. 1 (1994): 204–204; H. Curtis Wright, “Ancient Burials of Metal Documents in Stone Boxes,” in By Study and Also By Faith: Essays in Honor of Hugh W. Nibley, Volume 2, ed. John M. Lundquist and Stephen D. Ricks (Salt Lake City and Provo, UT: Deseret Book and FARMS, 1990), 273–334; Paul R. Cheesman, Ancient Writing on Metal Plates: Archaeological Findings Support Mormon Claims (Bountiful, UT: Horizon, 1985); Paul R. Cheesman, “Ancient Writing on Metal Plates,” Ensign, October 1979, online at lds.org; H. Curtis Wright, “Metallic Documents of Antiquity,” BYU Studies Quarterly 10, no. 4 (1970): 457–477; Daniel Johnson, “Metals and Gold Plates in Mesoamerica,” BMAF presentation, 2010, online at bmaf.org; William J. Hamblin, “Sacred Writing on Metal Plates in the Ancient Mediterranean,” FARMS Review 19, no. 1 (2007): 37–54. 8. Kirk B. Henrichsen, “How Witnesses Described the ‘Gold Plates’,” Journal of Book of Mormon Studies 10, no. 1 (2001): 18–19. 9. In this context, “doubled” simply means duplicated. Often a copy of a document was sealed in some manner while the other copy was accessible to anyone wanting to review its contents. The two copies were typically bound or joined together in some way. The sealed document helped authenticate the accessible one if a question of its legitimacy ever arose. 10. See Book of Mormon Central, “Why Would a Book Be Sealed? (2 Nephi 27:10),” KnoWhy 53 (March 14, 2016); John W. Welch, “Doubled, Sealed, Witnessed Documents: From the Ancient World to the Book of Mormon,” in Mormons, Scripture, and the Ancient World: Studies in Honor of John L. Sorenson, ed. Davis Bitton (Provo, UT: FARMS, 1998), 391–444; John W. Welch and Kelsey D. Lambert, “Two Ancient Roman Plates,” BYU Studies 45, no. 2 (2006): 55–76. 11. Henrichsen, “How Witnesses Described the ‘Gold Plates’,” 19. 12. Orson Pratt remarked, “Through the back of the plates were three rings, which held them together, and through which a rod might easily be passed, serving as a greater convenience for carrying them.” Henrichsen, “How Witnesses Described the ‘Gold Plates’,” 19. 14. See John A. Tvedtnes, “Etruscan Gold Book from 600 B.C. Discovered,” Insights 23, no. 167 (2003): 1, 6; “Out of the Dust,” Journal of Book of Mormon Studies 14, no. 2 (2006): 65. 15. Henrichsen, “How Witnesses Described the ‘Gold Plates’,” 16–21; Robert F. Smith, “The ‘Golden’ Plates” in Reexploring the Book of Mormon: A Decade of New Research, ed. John W. Welch (Provo, Utah: FARMS, 1992), 275–277. 16. See Book of Mormon Central, “What Kind of Ore did Nephi Use to Make the Plates? (1 Nephi 19:1),” KnoWhy 22 (January 29, 2016); Jerry D. Grover, Jr., Ziff, Magic Goggles, and Golden Plates: The Etymology of Zyf and a Metallurgical Analysis of the Book of Mormon Plates (Provo, UT: Grover Publishing, 2015); “Of What Material Were the Plates?” Journal of Book of Mormon Studies 10, no. 1 (2001): 21; Read H. Putnam, “Were the Golden Plates made of Tumbaga?” Improvement Era 69, no. 9 (1966): 788–789, 828–831. 17. See Bruce E. Dale, “How Big A Book? Estimating the Total Surface Area of the Book of Mormon Plates,” Interpreter: A Journal of Mormon Scripture 25 (2017): 261–268; Janne M. Sjodahl, “The Book of Mormon Plates,” Journal of Book of Mormon Studies 10, no. 1 (2001): 22–24, 79; John Gee, “Epigraphic Considerations on Janne Sjodahl’s Experiment with Nephite Writing,” Journal of Book of Mormon Studies 10, no. 1 (2001): 25, 79. 18. Witnesses said that the engravings were on both sides of each plate. See Henrichsen, “How Witnesses Described the ‘Gold Plates’,” 20–21. 19. 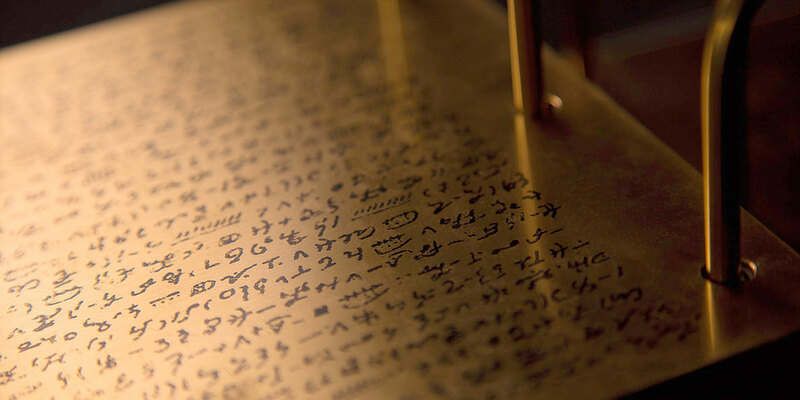 See Book of Mormon Central, “Did Ancient Israelites Write in Egyptian? (1 Nephi 1:2),” KnoWhy 4 (January 5, 2016). 20. For the scholarly research supporting this claim, see Brian D. Stubbs, Exploring the Explanatory Power of Semitic and Egyptian in Uto-Aztecan (Provo, UT: Grover Publications, 2015). The results of this study were adapted for a more general audience in Brian D. Stubbs, Changes in Languages: From Nephi to Now (Blanding, UT: Four Corners Digital Design, 2016). For reviews of Stubbs’ research by competent linguists, see John S. Robertson, “Exploring Egyptian and Uto-Aztecan Languages,” Interpreter: A Journal of Mormon Scripture 25 (2017): 103–116; Dirk Elzinga, Review of Exploring the Explanatory Power of Semitic and Egyptian in Uto-Aztecan, BYU Studies Quarterly, 55, no 4 (2016): 172–176. See also, Jeff Lindsay, “The Next Big Thing in LDS Apologetics: Strong Semitic and Egyptian Elements in Uto-Aztecan Languages,” Interpreter: A Journal of Mormon Scripture 26 (2017): 227–267. 21. John L. Sorenson, Mormon’s Codex: An Ancient American Book (Salt Lake City and Provo, UT: Deseret Book and Neal A. Maxwell Institute for Religious Scholarship, 2013), 701. 22. Rappleye, “‘Idle and Slothful Strange Stories’,” 35. 23. See Shanna Butler, “A Golden Opportunity,” New Era (February 2006): 34–37; “A Model of the Plates,” made by Steven Pratt, online at lds.org. 24. See Read H. Putnam, “Were the Golden Plates made of Tumbaga?” The Improvement Era 69, no. 9 (1966): 788. 25. Silver was sometimes, although not always, added to gold and copper in the tumbaga alloy. See Putnam, “Were the Golden Plates made of Tumbaga?” 789. Also, Martin Harris remarked that the rings which bound the plates were made of silver. See Henrichsen, “How Witnesses Described the ‘Gold Plates’,” 19. 26. See William J. Hamblin, “An Apologist for the Critics: Brent Lee Metcalfe’s Assumptions and Methodologies,” Review of Books on the Book of Mormon 6, no. 1 (1994): 462–470; Daniel C. Peterson, “Editor’s Introduction: ‘In the Hope That Something Will Stick’: Changing Explanations for the Book of Mormon,” FARMS Review 16, no. 2 (2004): xxviii; Peterson, “Tangible Restoration,” 32–33; Rappleye, “‘Idle and Slothful Strange Stories’,” 33–34. 28. The Three Witnesses’ experienced a supernatural, although completely discernable and describable experience with the plates and other Nephite relics. In vision, they saw the angel who first delivered them into Joseph Smith’s possession. The angel presented the artifacts before their eyes. And they heard a voice from heaven confirming the truthfulness of the translation of the plates. In contrast, the experience of the Eight Witnesses was strictly natural. Under completely ordinary circumstances, they were each allowed to touch and heft the plates for themselves. Literary scholar Terryl Givens has explained, “Taken together, the two experiences seemed calculated to provide an evidentiary spectrum, satisfying a range of criteria for belief.” Terryl L. Givens, By the Hand of Mormon: The American Scripture that Launched a New World Religion (New York, NY: Oxford University Press, 2002), 40. 29. See Jeffrey R. Holland, “The Greatness of the Evidence,” Chiasmus Jubilee, August 16, 2017, online at bookofmormoncentral.org. For a transcript of this talk, see “Elder Holland Speaks at Book of Mormon Chiasmus Conference,” at mormonnewsroom.org. 32. a. b. c. See Paul Y. Hoskisson, ed., Historicity and the Latter-day Saint Scriptures (Provo, UT: Religious Studies Center, Brigham Young University, 2001); Stephen O. Smoot, “The Imperative for a Historical Book of Mormon,” at The Interpreter Foundation (blog), October 20, 2013, online at mormoninterpreter.com. 34. See Ether 4:8–11; Doctrine and Covenants 5:4–20.